I love recurring tasks and use them all the time for repeating TODOs that I want to just forget about until they’re due again. One such task—ironically enough—is my monthly backup of Entourage’s glass-jawed database. 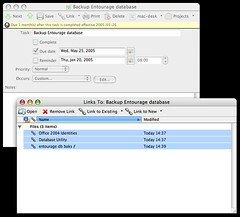 The beauty part is that I can embed links to the Database Utility app and both folder paths right in the reminder. When I get pinged each month, I can just open the calendar event, select all my stuff in the Links section, and click “Open.” Boom: the utility launches and the two folders open right on my desktop. No hunting, no searching, and no janky alias maintenance. Now if you’re already a long-suffering Entourage user, your eyes should be lighting up right about now, because this trick emulates several of the best features of the Project Center without the functional death march. No need to walk through the stupid wizard and tell it all the things you don’t need: just spark up a new task or calendar event, pop open the Links area, and start throwing your stuff at it. Super easy. Now, I know nobody ever wants to admit to their dark existence on the Entourage downlow, but I must ask: Anybody else doing cool tricks with linking? Got a neat way you keep your stuff tidy in Entourage? Share.